Although I’ve been drinking whisky for quite some time now, I can recall that even before I started drinking, I knew and had heard about Johnnie Walter. It wasn’t till later on in my whisky drinking years that I eventually came to learn about their blue label. For all my non whisky drinkers if you have not heard of it yet, I’d like to change that. This is a brand I feel you should definitely know about, if not only to impress someone with this knowledge, then to actually try a product that is as good as they say it is. The first time I tried the Blue label I was at a friend’s party about a year ago. Her parents are big Scotch drinkers and although they had alcohol out for the party I learned that they also had Johnnie Walker blue, but that bottle was her mothers and not meant to be served to the party. My first thought was to sneak into the kitchen and quietly pour myself a glass without anyone ever knowing. In the end I took the honest route and just asked Mrs. Favata if she would share just a tad bit, which of course she did. To help me write this blog, I revisited the blue label and had a dram last night as my boyfriend owns a bottle. The glass I had last night was as good as it was when I first tried it a year ago. In my opinion this is one of the smoothest blended whiskies I’ve ever tasted, so much so that I had to keep reminding myself that it was a blended Scotch. When I opened the bottle I first got hit with a sweet smell. In the palate to me it tasted woodsy (this whisky is aged in oak barrels), sweet, it has a slight burn and finishes with notes of spice. I very much enjoyed this whisky! All the blended whiskies in the Blue Label come together to form the perfect balance. It truly is blending at its best. Since having started my blog I’ve been asked by some for good whisky suggestions. So, for the ladies and my non whisky drinkers out there if you are looking for a good gift for a Scotch loving spouse, significant other, family member, or any other important person in your life, you can’t go wrong with giving them Johnnie Walker Blue. The one important thing to note is that because this whisky is produced in limited batches it will be an expensive gift as I’ve seen the price range go from $180-$250 depending on where you buy. If you ever purchase you will note that each bottle is numbered and that is because of the limited amount of product produced. A few other facts to know for all my non-whisky drinkers or those looking to start, Johnnie Walker was a product created by Alexander Walker in Glasgow. It is a blended Scotch whisky. When he first began his whisky blending journey he named this whisky Old Highland Whisky but it would later be renamed Johnnie Walter in honor or Alexander’s father, John Walter. They have five labels which include Red Label, Black Label, Double Black, Platinum Label, and the Blue label of Course. They also have a whisky called Swing which uses up to 35 whiskies in its blend. 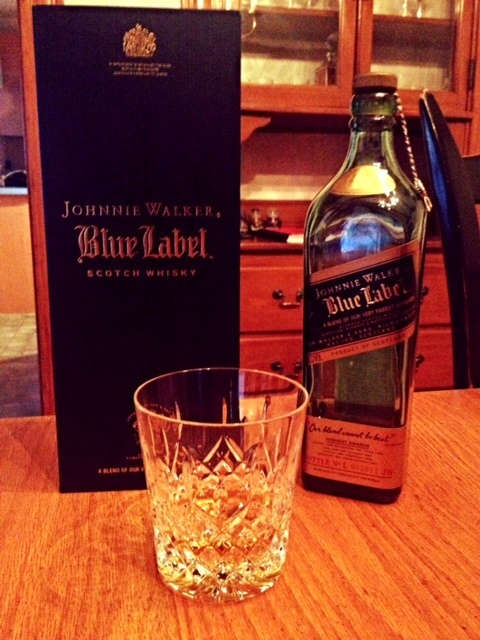 Overall, Johnnie Walker Blue Label is a great whisky to taste and possibly even have in your collection one day. It’s pricey but it is worth every penny and will truly not disappoint. It is a whisky I highly recommend to try.